‘Travel light’ is every world traveller’s mantra, but can be tricky when travelling with children and babies. Babies have different needs through each phase of their development — on a long trip like a sabbatical, how can you both pack light and ensure you have everything for your baby’s changing needs? Well the good news is that babies don’t actually need as much stuff as advertisers would lead you to believe. Especially if you’re breastfeeding your baby (which I highly urge you to do — always ready on demand at the perfect temperature!). One week’s worth of clothes, a few muslins / baby swaddles, three days worth of diapers and wet wipes is all you need, plus these top five essentials and baby travel life hacks. Some are classics, and some will surprise you. It’s always in the middle of the night when all the shops are closed that your baby has a fever, teething pain, or coughs herself awake. When traveling, not only do the shops have hours you’re unused to, you may not find the products you know and trust. It is absolutely essential to bring your baby thermometer, rubbing alcohol, sterile gauze, bandages, baby paracetemol / tylenol, cough vapour rub, and any other toiletries and first aid items you use consistently for your baby at home. Our very first week on family sabbatical, our toddler got an ear infection and our baby had a cough that was keeping her up at night. 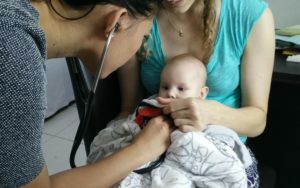 The doctor emphasised that it is essential that babies eat and sleep well, and said that if the coughing began to affect her sleep or eating she would insist on giving our baby antibiotics. Luckily we had brought a bottle of LUF (the Dutch equivalent of Vicks Vapo Rub) and by rubbing it onto her chest, back and under her nose and keeping the air conditioning off for a few nights, we managed to end the cough without needing antibiotics. We monitored her mild fever daily with our trusted thermometer, cleaning it with rubbing alcohol each time. Our second month on sabbatical, our baby started teething and again this started to affect her sleeping and eating. We brought our trusted brand of baby paracetamol / Tylenol 120 mg suppositories and she slept like…erm…a baby. The local brand of suppositories sort of dissolved before we could insert them, and the liquid paracetamol never quite made it all the way into her belly, but we had time to test them and see what worked while while our supply still lasted. Tip – Leave at home: makeup (for mama — the glow of being on holidays and the tan are colour enough! ), baby products you are unfamiliar with anyways (may as well use the local unfamiliar ones — for example, we should have left our baby zinc at home, it’s a big bottle and we have never used it at home or on the road). As we were speeding down the coast in a loud Filipino motor boat, equipped with a few stringy adult life preservers that were more useful as seat cushions than as flotation devices, I realised that an excellent packing item for the baby would have been an inflatable floatie / UV suit / swim suit (with a built in diaper). 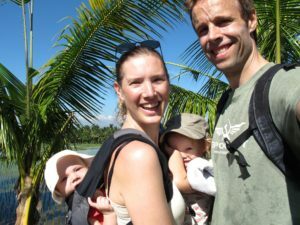 We have a UV suit for our baby, and we have water wings for our toddler, but we left our life jackets at home because their limited use would not justify the space they would take in our bags four months across southeast Asia. A UV suit with built in floaties around the waist would have done the trick, and take minimal packing space as the floaties are deflatable. I have searched across southeast Asia to buy one on the road but have had no luck, while this is something I could have easily found online at home and packed with us on our journey. We also brought with us a 10-pack of swimmer diapers which have been very useful at swimming pools, but leave them at home if you’re only going to the beach. Tip – Leave at home: towels, bath toys, swim suits that expose all your baby’s skin to the elements. Until our family sabbatical in southeast Asia, I had put diaper wallets in the same category as diaper bags, stroller organisers, and dooky covers: invented stuff to sell to parents. Our diaper wallet not only conveniently carries our diapers, wet wipes and a spare romper, it also doubles as a play mat everywhere we go. Few restaurants have baby seats in southeast Asia, but many have wide lounge seating which our baby can lay on while we eat. Whenever there is a questionable surface I just lay my diaper wallet down and she can play comfortably while I’m relaxed about what she’s chewing on. For short journeys I just grab the diaper wallet and leave the day bag at home. Tip – Leave at home: diaper bag, changing mat, sack n seat (never found a chair which fits the thing). The first time I saw a baby tent was when a French friend met me in the park. She sat down with me, popped open her baby tent, put her baby and a handful of toys inside, zipped it up and we were able to have an uninterrupted 45 minute conversation while the baby safely played mosquito-free in her ‘Royaume des jeux’ (Kingdom of toys). We have a Deryan tent, and I don’t know of any other brands but please mention them below in the comments if you know a good one. Our Deryan tent is our bed and mosquito net at night and sun, wind and mosquito cover for play and naps by day — especially at the beach. 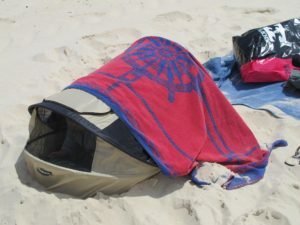 My husband likes to surf and with all of the dogs and dengue in southeast Asia, our tent keeps me feeling secure about our children on the beach while he’s in the surf. We even got stuck at a beach one evening (our driver disappeared) and the tent was big enough to fit both our baby and toddler long enough to call a taxi at mosquito hour (sunset). Tip – Leave at home: play pen / pack ‘n play, baby cot, baby cocoon. After diapers and breast milk, nothing is more valuable when travelling than a baby carrier. Unless you’re planning on travelling to suburban North America, strollers are useless for most of the world. A baby carrier solves your transportation, sleeping, car seat and cuddling needs, and frees up your arms and legs to carry about your business. You never have to worry about waking the baby because you need to pee, or it’s time to get out of the car, or going for a walk in nature. We have an ergobaby performance, and I don’t know anyone who owns an ergobaby and is dissatisfied with it. But there are lots of other preferred brands, and there is a whole baby wrap movement which swears that wraps are even better (though I find them less versatile). Our baby carrier holds the baby on our chests, on our backs and I have even found a way to lay her sideways and nurse her safely in a car while still securely locked in place. My sister can even hike up a mountain while nursing her baby in her ergobaby. The only real downside is that it gets hot in there. Hot for the baby and hot for the parents — especially with your baby on your chest. 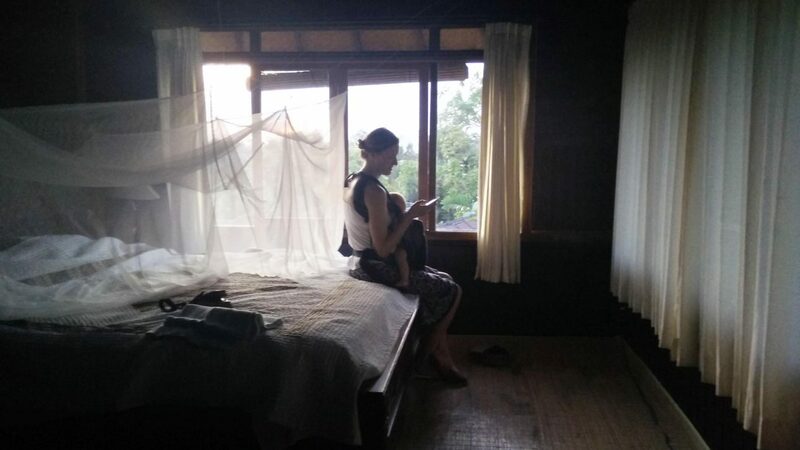 Travelling around Bali with our baby, where it’s always between 30 and 35 degrees, we have to be careful to give the baby some breaks from our chest. We wear her on our backs whenever possible and give her air whenever there’s a stop. Tip – Leave at home: car seat (unless travelling to a country that requires them by law, but half the cars on our trip don’t even have seat belts), stroller, pram, pushchair (most of the world is not suitable for wheels). Traveling with a stroller is a big struggle and humbling to realise how unnecessarily difficult life can be for people living with a disability, especially in wheelchairs. Broken pavement, disappearing sidewalks, unnecessary steps in shops, crowded restaurants, getting into nature and getting out of taxis / airplanes / trains / rickshaws quickly all make baby carriers a much more convenient option for baby transportation and security. What essentials do you pack when travelling with your baby? I agree with your choices, Lia. When we traveled with Lily and she was 10 mos we took all of the items you listed above. Our baby tent is a PeaPod and it is great but there were issues and the company had to send out recall pieces because some babies suffocated when slipping between the mattress and edge of the tent. We never had this issue with L and she was an active sleeper. We have those pieces but have never used them with it because if you fill the air mattress extremely full it is not an issue. And, we did cloth diapers on our trip and a cloth swim diaper and UV suit. We hand washed our diapers, but also I used biodegradeable disposable inserts which helped me feel like we weren’t impacting the earth too much while traveling. We did take an umbrella stroller which made long afternoon strolls through the markets easier because she would nap and I could use both hands to check out market items. But our carrier was our go to most of the time (we love our Ergo once baby is bigger but my Moby wrap was amazing when they were really little). I have been following your trip … it sounds so dreamy and we would love to do something like this one day but we want our kids to be older so they can learn from the experiences. Enjoy!! Sabrina you are my hero. I wish we had the discipline and energy to use cloth diapers but we have not. Good on you! It will definitely be interesting to see how travel and these experiences change over the years as the children grow older. My stepson (14) joined us on the first leg of the trip and it was a totally different chapter than now with two young children. I love your plan. And, yes, since this one is only 6 mos you definitely get to go again in five years. In regards to cloth diapers, they are actually quite easy, and even when life is busy, you have to fold laundry anyways, so you pack your diapers too. I never thouht about cloth diapers until we were pregnant with our first and then it seemed a natural step. My parents used them, so why couldn’t I? And, I’m a bit of an eco-geek, so any way I can decrease my footprint is big to me. I had to convince Steve at first but his experience with cloth was when he was a teen and his baby cousins were in old-school cloth, wrapped fabric and diaper pins. Cloth diapers have come a long long way since then, and once he saw how simple they were he was onboard. He is also an eco-geek, and as an electrician he is trying to convert our house as much as possible to LED lighting and solar power so we can try to be as self-sufficient as possible. We have plans to travel (no not to Disneyland, but head to Europe and experience the history, or to Asia) with our children but we want to wait until the kids are older so they can learn from these experiences and gain a broader perspective. For now, while they’re little, we teach them at home as best we can about the world and all the amazing people and places in it. That is very cool that your 14yo stepson joined you as it would be entirely different than your little ones experience. It will be very interesting to watch the kids grow and see what they gain and learn from the travel and being exposed to so many different types of people, religions, societies, etc. I applaud you both for teaching your littles to be global-minded people, as our children will need this more and more and they grow. So many kids that I teach do not have a perspective outside of their city (Langley) or the all-inclusive resort they visited in Mexico. Best of luck with the remainder of this sabbatical!